MEMBERS OF WOMAN’S CLUB HEAR SUFFRAGE TALK. Mrs. M. R. Trumbull Says Granting of Ballot Would Make Voting Result Doubly Cleaner and Richer. The vote extended to woman would have the same effect in increasing the vote of the country that a pint of pure cream poured into a bowl containing a pint of milk would have in increasing the contents of the dish. Not only would it double the quantity, but it would make it cleaner and richer and more wholesome. This was the simile drawn yesterday afternoon by Mrs. Millie R. Trumbull, speaking at the regular biweekly meeting of the forum of the Portland Woman’s Club in the auditorium of Old, Wortman & King’s store. The meeting was well attended and several prominent workers in the cause made addresses. The leaders were: Mrs. M. L. T. Hidden, president of the Oregon State Woman’s Press Club; Mrs. Mattie Sleeth, Miss Emma Wold and Mrs. Trumbull. 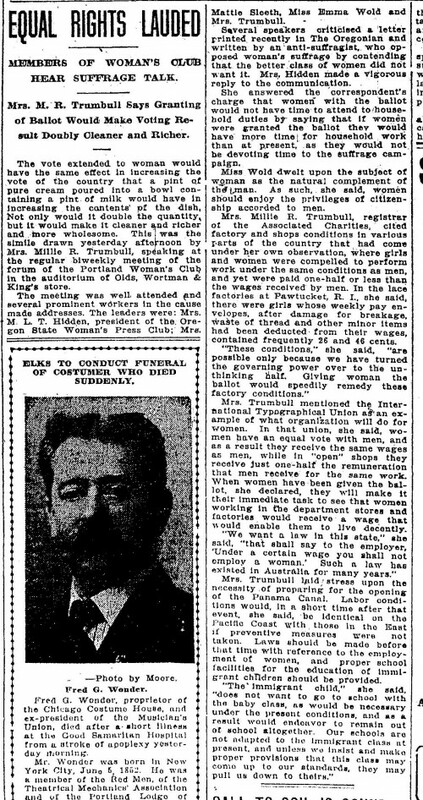 Several speakers criticized a letter printed recently in The Oregonian and written by an anti-suffragist, who opposed woman’s suffrage by contending that the better class of women did not want it. Mrs. Hidden made a vigorous reply to the communication. She answered the correspondent’s charge that women with the ballot would not have time to attend to household duties by saying that if women were granted the ballot they would have more time for household work than at present, as they would not by devoting time to the suffrage campaign. Miss Wold dwelt upon the subject of woman as the natural complement of the man. As such, she said, women should enjoy the privileges of citizenship accorded to men. Mrs. Millie R. Trumbull, registrar of the Associated Charities, cited factory and shops conditions in various parts of the country that had come under her own observation, where girls and women were compelled to perform work under the same conditions as men, and yet were paid one-half or less than the wages received by men. In the lace factories at Pawtucket, R. I., she said, there were girls whose weekly pay envelopes, after damage for breakage, waste of thread and other minor items had been deducted from their wages, contained frequently 26 and 46 cents. Mrs. Trumbull mentioned the International Typographical Union as an example of what organization will do for women. In that union, she said, women have an equal vote with men, and as a result they receive the same wages as men, while in “open” shops they receive just one-half the remuneration that men receive for the same work. When women have been given the ballot, she declared, they will make it their immediate task to see that women working in the department stores and factories would receive a wage that would enable them to live decently. Mrs. Trumbull laid stress upon the necessity of preparing for the opening of the Panama Canal. Labor conditions would, in a short time after that event, she said, be identical on the Pacific Coast with those in the East if preventive measures were not taken. Laws should be made before that time with reference to the employment of women, and proper school facilities for the education of immigrant children should be provided.